How to become a member of the Aam Aadmi Party in Kerala? 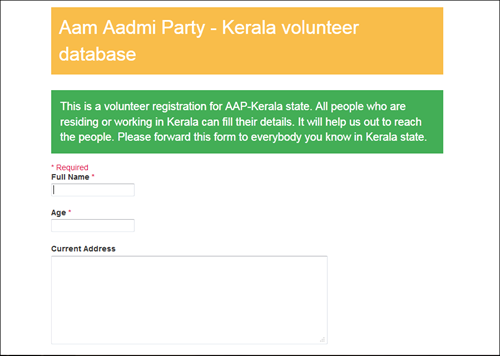 Are you wondering, how to be a member of the 'Aam Aadmi Party'(AAP), Kerala Unit? Then you have reached the right place. Read below and you get to know the details about the Eligibility, Criteria, Membership Fee and so on to be a AAP member. The 'Aam Aadmi Party' is the youngest political party in India. It was started by the anti-corruption activist Arvind Kejriwal on 26th November 2012. Our nation and our state is right now in the hands of corrupted leaders, this will in-turn make the life of the common people miserable. We need to put an end to it. The 'Aam Aadmi Party' has come forward with this vision and is been widely accepted in India. The 'Aam Aadmi Party' (AAP) is believed to be the common-man's party. Within few months of establishment, this new political party has announced the establishment of a AAP Kerala Unit. Most of us, the general public would love to be a member of such a party and to bring out the corruptions prevailing in our state. Only then we can lead a happy life or else we and our future generations will have to suffer a lot. Individually we cannot do much to erase the corruption in Kerala, hence let us all joint together under the shade of AAP and fight against our present corrupted leaders. Follow the simple steps mentioned below and you will also be a AAP Kerala unit member. How to become a member of AAP in Kerala? Any Indian citizen, residing in Kerala or working in Kerala can be a member of the 'Aam Aadmi Party', Kerala unit. For this, one must have to attain the age of 18 years like in the case of any other political party in India. Membership forms are available online and in the official website of the 'Aam Aadmi Party'. Thos who are interested to join this party and to fight against corruption jointly, can log on to any of the below mentioned websites and submit your personal details. After entering your details, either take a print out of the form and sent it to the office of 'Aam Aadmi Party' along with a postal Order of Rs.10/- via postal mail or submit the form online and pay online. While sending the form via post office, you can keep the counterfoil as an acknowledgement with yourself. The Membership Application Form requires you to fill-up certain personal details of yours. Some of these are mandatory while others are optional. The mandatory details required includes your 'Full Name', 'Fathers'/Husband's Name', 'Age', 'Current Address/House Address', 'Phone Number', 'Sate', 'District' and 'Are you a registered voter at your current address?'. Other columns such as 'E-mail ID', 'House No', 'Ward No', 'Profession', 'Skills' etc are optional. A Membership Fee of Rs. 10/- is required to be a member of the 'Aam Aadmi Party'. You can either purchase a single Postal Order of Rs. 10/- or two Postal Orders of Rs.5/- each from your local Post Office. There is a column "Pay To" in the Postal Order, there you have to mention "Aam Aadmi Party'. Interested residents can also fill up the form online and pay the amount online using Credit Card, Debit Card or Internet Banking accounts. An important point to be noted is that AAP has not so far appointed any one to collect the Membership Fee on its behalf, hence sending the same by Postal mail or through online is advisable. For any further queries or clarifications, you may directly contact the main office of the 'Aam Aadmi Party'. Their postal address, Helpline number and E-mail address are given below. Aam Aadmi party is an utter failure not only in kerala but in whole India. They came as a political party agaist corruption. They fought in Delhi election and got many seats and ruled the state for only one month. Arvind Kejrival, their leader has taken an foolish decision to resign from chief minister post and dissolve the government. Theey couldnt with stand with their policies. Many main leaders left their party and they got only 4 seats. This shows the loss of faith of people in that party.